This fighter they call “GGG” came to the US from Kazakhstan after winning a Silver Olympic Medal in 2004. He was 350-5 in the amateurs losing to a Russian amateur in the finals who pitty pattered up points and knew as a professional he would never succeed as he did as an amateur. On the other hand his opponent Gennady Golovkin had a professional style and chased him. Golovkin turned professional in May of 2006 in Germany and won his first 23 fights, 20 by knockout, when he debuted in the US. He was defending his WBA and IBO titles against the European champion Poland’s Grzegorz Proska, 28-1, having reversed his lost in gaining his title. It was held at the Turning Stone Resort & Casino in Verona, NY. Proska found himself on the canvas in rounds one, four and five before the referee had seen enough and halted the mismatch. It was September of 2012. The Proska fight was when the fans of the US were given their first view of Golovkin now living in L.A. under the watchful eye of trainer Abel Sanchez. His manager is Tom Loeffler, the architect that would guide his career. The people in attendance and those viewing him on the cable were star struck with this warrior who could box as well as fight and was very humble with a smile that was deceiving compared to the way he broke down his opponents. I asked for Golovkin to come to the phone. I asked being from KAZ are you a Muslim? He replied, “no, I am Orthodox with my father from Russia and my mother from Korea.” I traveled for the first time to NY to the MSG Theater to watch this match. Philly Boxing History editor John DiSantos who had been there during the interview in Philly was pulling for Rosado as I was pulling for Golovkin. Except for half a round it was a “blood bath” with Rosado’s blood being spilled on the canvas and ropes! Rosado brought in his 21-5 record with a 7 fight winning streak. The referee finally stopped the one sided event at 2:46 of the 7th round with Golovkin ahead 60-54 twice and 59-55 once. Rosado despite being declared the loser went to the corner and jumped up on the ropes with hands held high not in victory but in able to “survive” without going down into the 7th round against the best P4P fighter in the world, Gennady “GGG” Golovkin. When the ring was cleared it took two attendants about ten minutes to get as much of the blood off the canvas and the ropes as possible. A star was born in his previous US appearance but how it did shine that night at MSG. It was the twelfth straight stoppage by Golovkin. It was the fifth WBA defense and Monte Carlo in two months he would defend against Japan’s Nobuhiro Ishida, 24-8-2 who had gone the distance in his two previous fights against interim WBO Super welterweight champion southpaw Paul “The Punisher” Williams, 40-2 and Russia’s Dmitry Pirog, 19-0, over 12 rounds each. But on this night he faced someone he had never encountered before, GGG! In the third round he found himself knocked out cold! Next up for Golovkin would be European champion Matt “Mack the Knife” Macklin, 29-4, in June of 2013 at the MGM Grand, in CT, where in the second round Golovkin ripped open a cut over the left eye of Macklin with a right hand that hit like a razor blade! In the following round Macklin was counted out on his back! Next would be NABF Middleweight champ Curtis Stevens, 25-3, looking to “expose” Golovkin. He found himself on the canvas in the second round and survived until the end of the eighth when he was not able to come out for the ninth round. In February of 2014 Ghana’s Osumanu Adama, 22-3, out of Chicago, IL, was brought in proclaiming a knockout win. He was dropped in the first, sixth and seventh before the referee put a stop to the slaughter in Monte Carlo. Former IBF World middleweight champ James “Real Deal” Geale, 30-2, came to challenge Golovkin, at MSG, and lasted only into the third round. In October of 2014 Golovkin would travel west to the Stub Hub Center in Carson, CA, among many Mexican supporters of his opponent Marco Antonio “El Veneno” Rubio, 59-6-1, with 51 knockouts, the interim WBC champ who didn’t make weight by several pounds. Rubio was knocked cold in the second round. The Mexican’s had a new hero who fought like a Mexican warrior named “GGG”! In February of 2015 Golovkin found himself once again in Monte Carlo to face the UK’s Martin Murray, 29-1, the WBC Silver champion. Murray was knocked in the fourth and tenth rounds and finally stopped 0:50 into the eleventh round so far behind on points only a knockout would win for him. 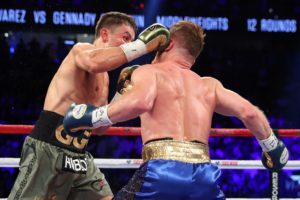 In May Golovkin was back in CA, at the Inglewood Forum, facing southpaw Willie “Mongoose” Monroe, Jr., 19-1, who was down in the second and sixth rounds when halted in the sixth. The newly crowned IBF World Middleweight champion from Canada David Lemieux was brought in with the title belt wrapped around his shoulder into the MSG ring. He wouldn’t leave with it as he was down in the fifth and stopped in the eighth round. In April of 2016 Golovkin face unbeaten Dominic Wade, 18-0, at the Inglewood Forum, dropping him once in the first and twice in the second where he was counted out on his back. In September the winner would travel to the UK to face their Kell Brook, 35-0, IBF World welterweight champion who came in at the same 159 as “GGG”. In the fifth round Brook had his right eye socket fractured halting the fight. Back to MSG on St. Patty’s Day Golovkin would face a full-fledged middleweight in New York’s own Danny “Miracle Man” Jacobs, 32-1, with 29 knockouts. After the day before weigh-in both fighters tipped the scales at 160. Jacobs pulled a “fast one” refusing to come to the day of the fight weigh-in as Golovkin scaled in at 170. By that night he would fight an overweight light heavyweight in Jacobs at what looked like 185. Jacobs would surprisingly fight the entire fight southpaw and give Golovkin a close but obvious win. Jacobs was down in round four which helped Golovkin win by scores of 115-112 twice and 114-113. This writer had Golovkin ahead 115-112. It would be eight months before Jacobs entered the ring again and it wasn’t against Golovkin. Six months later on September 15th after the Jacobs fight Golovkin whose knockout streak of 23 straight was broken would face Mexico’s Saul “Canelo” Alvarez, 49-1-1, with 34 knockouts only losing a majority decision to Floyd “Money” Mayweather, at 154. For five rounds they battled before Alvarez couldn’t handle the “heat” of Golovkin’s punches and kept moving away from the champion for the next seven rounds. When the decision was announced it was quite obvious a PPV payday for the promoters was influencing the judges. Byrd’s 118-110 for Alvarez had “fix or incompetent” written all over it. Was she blind? Moretti’s 115-113 for Golovkin was followed by Trella’s 114-114 draw! This writer had Golovkin a wide winner taking the second half of the fight as Alvarez was on the move. The look on Golovkin’s face told it all. He knew he had be had! In the meantime Alvarez was “celebrating” a draw! A PPV deal was probably set before the decision was announced. Alvarez tested positive for two drug tests after this bout. Why the draw decision wasn’t changed to a No Contest or No Decision could be a first. Alvarez decided not to enroll into the WBC’s clean boxing program and therefore was removed from their rankings. He was put on a 6 month suspension by the Nevada Athletic Commission in April prior to a May 5th rematch. Filling in for Alvarez was 2004 USA Olympian Vanes “Nightmare” Martirosyan, 36-3-1 (21), having never been stopped and an Armenian from Glendale, CA. Though it had been two years since he had his last fight which was a losing one he was still ranked among the super middleweights. The bout was held at the Stub Hub Center, in Carson, CA. Martirosyan was dropped in the second and stopped at 1:53 of the round. The IBF has informed Golovkin he’s been stripped of his title due to not fighting his No. 1 contender Russia’s Sergiy “The Technician” Derevyanchenko, 12-0 (10), living in Brooklyn, NY, he will be stripped of his title. The Russian and former WBA Middleweight champion Danny “Miracle Man” Jacobs may be fighting for the vacant title. Jacobs is No. 3 in the IBF with No. 2 vacant. He is No. 1 in the WBO where the champion Billy Joe “Superb” Saunders hasn’t fought since December of 2017 and No. 1 in the WBA and No. 2 in the WBC. Jermall Charlo, 27-0 (21), of Houston, TX, is the interim WBC Middleweight champion. Japan’s Ryota Murata, 14-1 (11), holds the WBA World Middleweight title. UK southpaw Billy Joe “Superb” Saunders, 26-0 (12) holds the WBO World Middleweight title. It had been rumored Golovkin was looking at meeting Saunders prior to the Alvarez to be his next opponent. There is so much bad blood between the fighters at this point that there will not be a press conference or a press tour and the fighters won’t meet face to face until fight week. There will be a split screen press event on Facebook next week. “Canelo can walk to the ring last. He can walk to the ring first. The important thing is who leaves the ring last,” said Golovkin. “I will demonstrate who is the best when I defeat Golovkin soundly on September 15th on (Mexican) Independence Day week-end,” said Alvarez. For some reason Alvarez with no belts again gets the larger percentage of the money. It will be the twenty-first title defense for Golovkin.